Harrogate’s James Willstrop lost out to long-time rival Nick Matthew in the final of the British Squash Grand Prix. 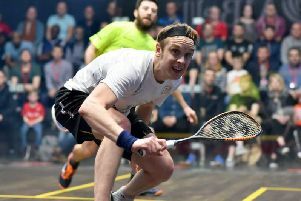 Willstrop, who hasn’t beaten Matthew in a tour event since 2007, had gone into the showpiece at Manchester’s National Squash Centre boosted by a semi-final win over world number three Gregory Gaultier. But he admitted afterwards he couldn’t contain a player who was simply “too good” on the night, eventually going down to a 3-0 defeat. “I just wish I could have given him more of a match,” said Willstrop. “But I have to salute him. I gave everything there but he was too good, and too accurate - I couldn’t get him out of position. Matthew, who trains regularly in Harrogate under local coach Dave Pearson, started strongly to take the opening game before withstanding an onslaught from his 33-year-old opponent to also take the second game tie-break. The third game proved the most comfortable of the lot to enable him to lift the 34th PSA World Tour title of his career. Reflecting on his triumph in yet another high-profile meeting with Willstrop, Matthew said: “We’ve played an incredible number of matches - big tournament matches in semi-final or finals - against each other and this was another so I’m just delighted to have come out on top. “A lot has been said about our rivalry but there is a tremendous admiration for what both of us do on the court. “Off the court as well in the way we prepare, we couldn’t be two more different people but that leads to some unbelievable matches. “It wasn’t easy at any stage and it could have been very different. In that second game Willstrop showed how good he was and I was lucky to get that game.